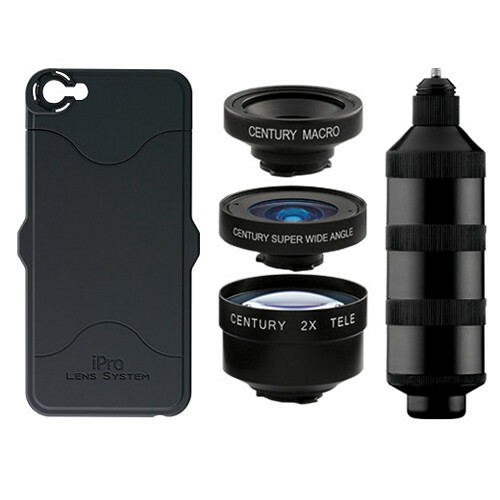 The Series 2 Trio Kit for iPhone 5s/SE from iPro Lens by Schneider Optics includes the Series 2 Case for iPhone 5s/SE, the three-section Series 2 Combi Handle, three Series 2 lenses and a lens cap that fits all three lenses. The kit features a 2.5x macro lens, a 0.45x super wide angle lens and a 2x tele lens. It provides everything you need to improve your iPhone's image capturing capability and each lens screws directly onto the case. The three-section handle can attach to either side of the case. It works as a tripod mount, but the handle also acts as a case for all three of the included lenses. This kit is compatible with the iPhone 5s/SE only. Box Dimensions (LxWxH) 5.7 x 3.3 x 1.9"
Series 2 Trio Kit for iPhone 5s/SE is rated 4.4 out of 5 by 9. Rated 4 out of 5 by dbphoto from Sharp and easy to use Nice sharp lenses and easy to use.I mostly use the telephoto and its much nicer than using the digital zoom, by pinching the screen on the iPhone. They come in a handy 5 piece case and are easy to store when not in use.The downside is the main case, that goes around the phone, its very hard to get off, though gets easier once you finally get it off the first time.I find the wide angle too wide for my taste and it results are close to the distortion of a fish-eye. They do make a less wide lens but not sure if comes in a similar kit. Rated 4 out of 5 by Rick from GOOD QUALITY, NICE GADGET, VERY PORTABLE I just received this item, and had not been able to use it extensible, however for the few shots I took with each lens, the quality of the pictures is great when paired with Camera +, it could also be a great creative play tool when paired to the Hipstamatic App. I can see myself having fun with this kit, when I don't feel like taking either one of my bags; instead I can put my phone in my left packet, this kit on the right one and just go for a walk. Rated 2 out of 5 by Anonymous from Great lenses! But... The phone case is terrible. It can't allow my glass front covers due to the case wrapping around the phone. Ever since I had to take off my front glass shield I got a few chips on my phone and the case that ipro developed is so flimsy and it doesn't cover the whole phone but only 70% of it. The phone case coverage for the front leaves a lot to be desired, as I've seen cheaper no name companies develop a better phone case than ipro. Other than that the all lenses work great and helps me take better pictures. Rated 5 out of 5 by Anonymous from Worth it! I previously avoided getting lenses for my iPhone because I thought they would not be easy to use. I decided to buy the Schneider Series 2 Trio Kit because of the convenient design and I was not disappointed. It's compact and easy to carry in my pocket so I take it everywhere. The one recommendation I would make for future designs is to have a way of securing the lens cap so it does not need to be carried separately from the handy tube of lenses. I solved this myself by adding some velcro to the lens tube to hold the cap until it is needed. Rated 5 out of 5 by Anonymous from New To iPhonography Images from lens are great with good contrast and resolution; was especially impressed with macro lens. This is my initial foray into iPhone photography on a more serious level and the iPro Trio kit should provide expected results from all initial indications. I am using with Pure and ProCamera apps. Rated 5 out of 5 by Anonymous from Quality iPhone camera gear Schneider created good quality macro, wide angle and telephoto attachable lens for iPhones. The lens screw into a handle that attaches to the phone case. The lens are secure and easy to carry in the case. Rated 5 out of 5 by chris12357 from Great Image Quality Lenses are really clear. iPhone 5 case is pretty basic bought iPhone 5s kit and iPhone 6 case because it was cheaper to do this than the iPhone 6s bundle I wish the lens cap fit in the handle. The lens covers up the flash. Can I add a flash for the iPhone? They do make external flashes for iPhone. Not an Apple product though. Does the telephoto lens have circular polarization? Can I manually focus with the telephoto lens? No, there's no manual focus ability for any of the lenses. Only through whatever app you're using. Do any of the lenses in this kit include front threads for attaching a filter? If so, what is the filter size?